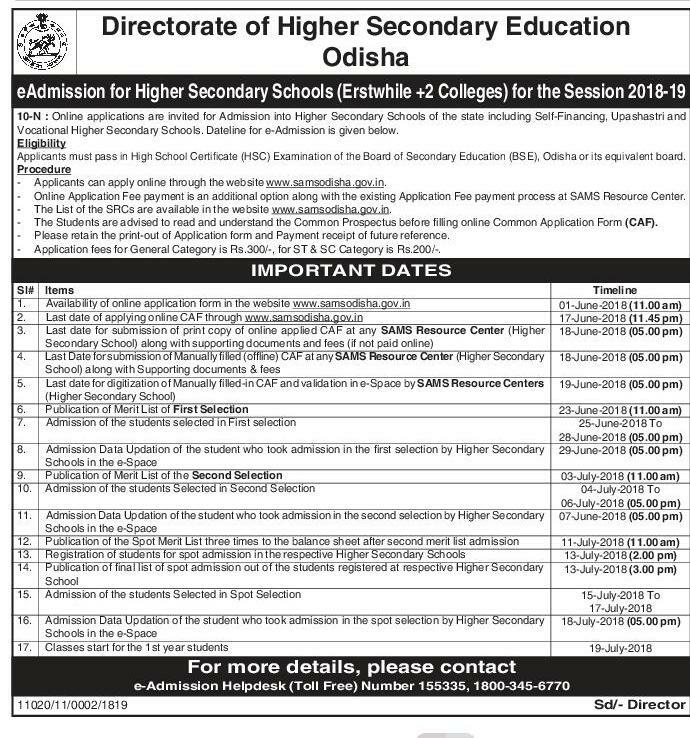 Department Of Higher Education, Govt Of Odisha Declared +2 (Junior College) e-Admission Notification for the Year 2018-2019. Candidates Can apply different private/Govt College according to their Choices. 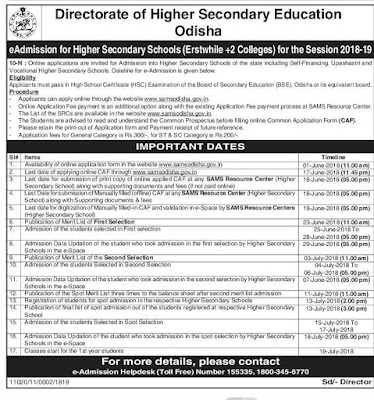 Various college have separate Cutoff Marks So Students need to Check their Previous Year college cutoff Mark if they are eligible then they can apply otherwise may be they lose one chance to take admission. This Year Candidates Cant Apply Offline Mode. Only Online Mode Candidates Can Apply their Application Form. This Year Admission Process will Conduct through SAMS Centre Candidates Need to Apply Online Form After that They Need to Submit their Hard Copy On their Nearest SAMS Resource Centre. Qualification- 10th Pass Candidates Can take Admission into +2 Courses in Odisha. Candidates Can Check Last Year Cutoff According to that Can Apply. Candidates will Selected On the Basis Of their Mark Secured On 10th Class Matric Exam. Check here Last Year Odisha +2 e-Admission College Cutoff Mark. Candidates Can Apply though Official Website By uploading their Photo, Signature and Required Documents. 01. Candidates Need to Visit Official Website of www.samsodisha.gov.in After that by Clicking Higher Secondary/Junior Link. New Page will be Displayed their They can Apply their Forms.